I was hankerin’ for some comfort food. Something that cooks slow all day, filling the house with a delicious aroma. This mushroom pork tenderloin was it. You know when you’ve hit the spot when all you hear are moans of delight when everyone starts eating. No one says a word. Perfect! I could sit down and eat a bowl of the mushroom gravy by itself, actually. We served this mushroom pork tenderloin with garlic mashed potatoes and roasted carrots. Also try my crazy-yummy pork medallions in mushroom Marsala sauce. I always run to the store whenever pork tenderloin goes on sale. It’s the pork equivalent of filet mignon. Add 1 tablespoon of the oil to a Dutch over high heat. Add the tenderloins and quickly sear on all sides. You're not trying to cook them, just get a little color. Combine soups on a bowl and pour into the Dutch oven. Cover and cook for 4 hours or until pork begins to fall apart. Heat remaining oil over high heat in a small skillet. Add the mushrooms. Stirring, saute the mushrooms until they start to soften. Remove mushrooms from heat and sprinkle with thyme. Toss to mix. Add mushrooms to Dutch oven and stir. Cook 30 minutes-1 more hour until the pork completely falls apart. Remove any large pieces of pork and chop or shred. Return them to the pot. Serve with mashed potatoes and loads of the gravy. 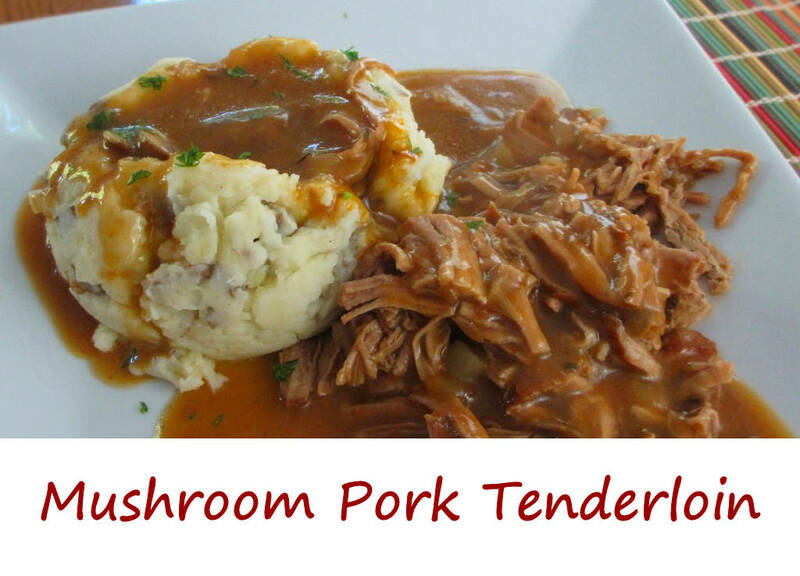 This entry was posted in Main Dishes and tagged mushroom, Mushroom Pork Tenderloin, pork tenderloin, recipe by Mike. Bookmark the permalink.